This stallion was bred twice last year and we are anxiously awaiting arrival of the foals. We will be breeding him to some of our special mares, and have presently had requests from other mare owners to breed to him. White has become a popular color in recent times, and we will be trying for this true white. 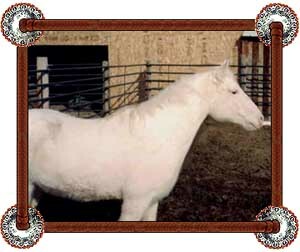 This stallion is a full brother to a white stallion, purchased the year prior, by Rex Peterson, trainer of the Black Stallion. �Casper� loves to play and be a part of your daily activities, and displays this often when we are working with the horses. Merry's Solid Platinum has the High Time D. T. , Tamarack Kid, Merry Boy bloodline, going back to Allen F-1 on his topline. His dam's side offers Maid of Magnolia, Lady May's Traveler and Allen Supreme - all strong infusions of the foundation bloodlines. We do have high hopes for the breeding of this Stallion, not only color, but for the great disposition he displays in his gentleness and desire to be handled. He has responded to being worked with, as pure enjoyment. 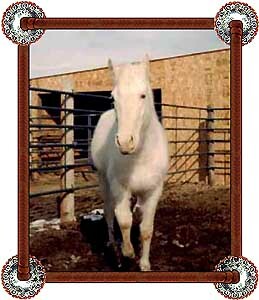 Casper displays the same disposition, gait, and conformation that his Sire Merry�s High Time does. He had only been saddled and someone on his back once, and when we went to pick him up to take pictures, we saddled him, brushed him all over, trimmed his feet, and got on and rode him around several times, and he acted like a pro. 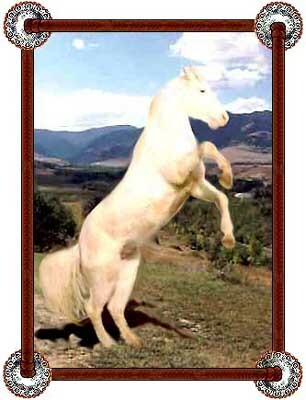 �Casper� loves attention, loves to be brushed, and is a people horse. We believe he will be an outstanding breeding stallion, and we are looking forward to getting more babies on the ground from this guy. 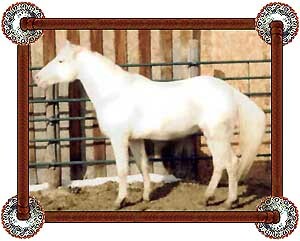 The bloodlines he carries are from the Allen F-1 breeding, and a long time of careful breeding has given us this horse along with his full brother a year earlier that was also pure white. 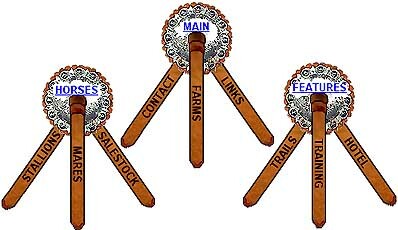 Mares must not be shod on hind feet during breeding. They must have recent health checks, worming and all shots, prior to being bred. Mare care with foal is $4.00 per day or $90.00 per month. Mare care for mare only is $3.00 per day, and $75.00 per month. Booking fee $100.00 prior to breeding season. Please contact C.J. 's Walkers for more information. Please click on a conch or a strap below.